It was probably the line that defined years 10 through… well… forever in my life. “To infinity and beyond!” Who could possibly forget the immortal words of Buzz Lightyear in the classic Toy Story. It is a sentiment that probably rings true for many a motorcyclist. The new TCX Infinity EVO Gore-Tex Boots are built with that exact ethos. With a solid, beefy construction that is equipped for the harshest of conditions, this boot is still comfortable and highly tactile. From the highly durable new Aluminum 6060 buckles to the redesign of the outer shell for a smoother look, this boot has undergone a complete overhaul from its predecessor, the original TCX Infinity GTX. 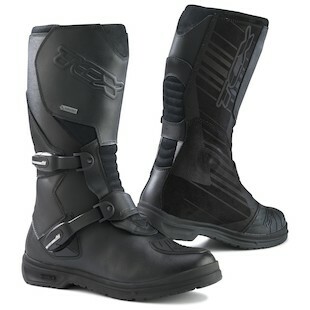 Most notable, however, is the upgraded sole that has been developed through a team effort with Michelin. By going to the tire expert, TCX was able to incorporate a sole that improves grip on and off of the bike. Whether it be the improved evacuation of water, the extended edge for better grip on differing terrains, or the wider contact surface that allows for better adherence, the Michelin sole is a nice addition to this CE-Certified boot. We all see the horizon. It is there every morning. It is there every night. The difference is that some of us want… no… have to see what is beyond it. If you are one of these people, TCX knows how you feel and has designed the Infinity EVO GTX boots to better assist in your journey.